A warm welcome to Jordan from the Farah Hotel! With us you will get the most peaceful nights sleep yet we are also deep in the heart of Amman's historic Downtown area. 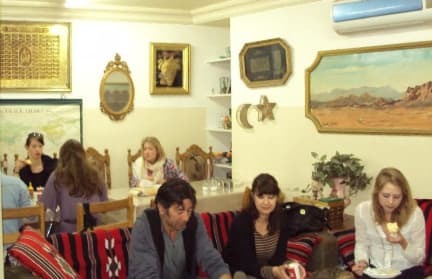 Famous to travelers for its easy, welcoming style, our hotel's lounge and Bedouin area are great places to meet other travelers and exchange stories over mint tea or breakfast which is included. We offer large doubles en-suite, normal doubles, singles and dormitories for up to four people, our dormitories are a unique way for you to meet and stay with groups of fellow travelers. The easy-to-book trips that are on offer at the reception are cheaper with larger groups of people, so a stay in one of our dormitories gives you a great way to find new friends with whom to explore the fabulous sights on offer in Jordan, and it also helps to keep your budget down. There are hot showers to relax you after a days exploring and we also have fridges on every level which allow guests to store their own food. 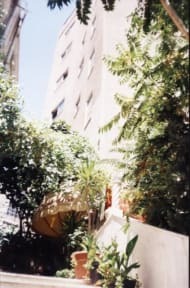 So you could enjoy a sunset drink in your room looking out over the culturally rich Downtown area and once you have done that, and because we are so central, you could easily step out to explore Amman at night. Or if you are tired from your travels just relax whilst watching a film on satellite TV in your room. Films are also on show in the lobby in the evenings and once again it gives you a great opportunity to meet others over a drink. Then there is just enough time to send a quick email home using our internet access or even call friends and family with our cheap international calling service available in the lobby. Our handpicked, local staff will help answer all your questions about visiting Jordan's attractions and you can even organize to be picked up at the airport if you book with our friends at Hostelworld. Any other questions, be it from visa queries to border crossing details, and our staff are just waiting to give you the inside information. You are welcome and we cannot wait to have you as part of the Farah family! Our tours are designed with YOU in mind! Competent, experienced and friendly, our driver is expert at highlighting your way around Jordan. Pointing out the most interesting and imaginative, cultural and historical points, he will also be able to help you with additional tips; quality, yet inexpensive restaurants, shopping tips, etc. Sure to make your trips around Jordan pleasurable and exciting! Mr. Michael Nazzal, Chairman of Jordan Hotels Association. I had the pleasure of visiting your hotel today after reading so much on all sites about it and I was happily impressed with the cleanliness standards and the efficiency of your operation. It is a great pleasure to see motivated hoteliers doing the right thing for the development of the Jordanian tourism. Farah Hotel is situated in Downtown - so you get everywhere by foot really easy. The staff is very friendly. Für den Preis und die Lage absolut in Ordnung. Das Zimmer war sauber, nur ziemlich warm (oder mit Klimaanlage viel zu kalt), der Ventilator hat nicht funktioniert. Das Bad war etwas sanierungsbedürftig und hätte besser geputzt werden können. Mitarbeiter sehr freundlich und hilfsbereit. Frühstück in Ordnung. All the facilities are very old and need to be renovated, especially the sanitary facilities. Staff and location are great.